Hello, we are It Takes An Island. We are a community platform that helps prepare children for a fast-changing future, by exposing them to learning experiences rooted in real world engagements. Our experience-driven programs and activities currently focus on children 10 to 16 years old who come from every background. Founded in 2017, IT TAKES AN ISLAND derives from the phrase “it takes a village to raise a child,” embodying our belief that learning extends beyond home and school, and that it will take an entire island to help children realise their full potential. The beginnings of It Takes An Island happened at a hackathon. Two sisters, its youngest participants, challenged a room full of adults, and shamelessly directed questions at PhD-holding experts. Despite their age they came up with something refreshing and innovative. Needless to say, they did not win the hackathon nor did they have the most impressive presentation (albeit the loudest). But they learned new skills, made new friends, and were inspired to feed their curiosity. The experience also inspired their parents and their friends to organise another hackathon, this time more tailored for children. 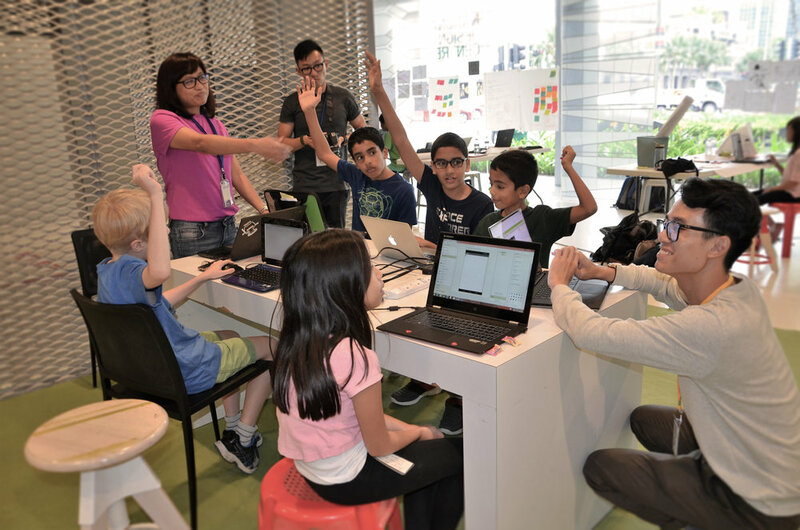 In less than a month, the small group, through its network of experts and volunteers, and partnership with an activity centre, mounted its first kids’ hackathon. The fully booked and well-received event led to enquiries from other parents for similar future activities, and also sparked interest from corporations and schools. Clearly, the idea for experience-driven learning beyond the four walls of home and classroom was catching on. As they say, the rest is history, and there has been no looking back since. as a product or solution. In the real world, people who work together come from different socio-economic and educational backgrounds, and are shaped by varying religious beliefs, cultural influences and family histories. It Takes An Island believes in simulating this wide variety of perspectives and ideas when we group the children into teams during activities. We like to 'mix up' children from private schools, public schools, international schools, and child-centric welfare organisations. Apart from teaching them to be tolerant and respectful of each other, we also encourage cross-cultural learning. These older kids have an ideal level of maturity, and possess requisite math, logic and language skills for most of the Island's activities. Both age groups also often share a common challenge: they are at a point in their academic lives where they feel the choices they make for the next step - be it for secondary school or university, or even for which enrichment classes to take - will more or less ‘lock’ them into certain future careers. Confusion and dilemmas occur when the prescribed key strengths or capabilities from established education streams do not necessarily match natural inclinations or parental preferences. By exposing these children to hands-on, 'real work' activities that engage people in actual work environments, they become better equipped to make informed choices. Julie has always been the curious one. To this day, her grandparents will lament how Julie was found in every crevice of the neighbourhood, including inside trash collection bins, on a mission to satisfy that curiosity. As an adult, her curiosity lives on as an entrepreneur wanting to learn more, solve more, and create more. As a parent, she wonders how she can allow her children to hone that curiosity gene they obviously inherited from her. Unfortunately, letting her children explore the trash collection bins is an option frowned upon so she instead envisioned It Takes An Island, which should be the next best thing. Before It Takes An Island, Julie held what her mother would call 'real' jobs in companies such as KPMG and NUS, but in reality spent the majority of her career starting and managing companies in management consultancy, investment, and travel. Pat was raised by a journalist father, and by a mother who helped the World Bank put up roads and bridges. It’s no surprise that when she grew up, she would continue the family tradition of telling stories and building bridges - albeit the latter are now of a different kind. Today, Pat is a marketer for some of the world’s top technology and entertainment brands (Samsung, CBS Interactive), as well as an entrepreneur with a string of start-ups under her belt (some successful, some proudly failed): an art gallery/bar, a games development house, a media convergence consultancy, and now, It Takes An Island. Pat nurtures her love of art and storytelling with her family. She is married to a writer, and has two daughters, both gifted artists and curious creators. All are active, happy Islanders. As a child, Fara loved solving puzzles and, in this space, happy moments consisted of a page of connected dots, a filled crossword box, a mystery explained, a king in check, a theorem proved, and, yes, a well plotted flowchart. It is this love for finding solutions to problems that attracted Fara to coding and tech because after seeing “Hello, World” flash on your green screen by writing a few lines of gibberish, what else can you not not do? It is fascinating how tech has extended out of the corporate world to be applied to everyday but no less important problems such as connecting families and friends, and democratizing knowledge. Fara hopes that through It Takes An Island she gets to do the same. Aside from being a coder, Fara is also a technical writer and technical educator, and has worked and consulted with companies such as Software AG, NCS, SCS, Sybase SAP, and NUS. Hayden is a digital media enthusiast with a techie background. By day, he can be found photographing dogs. By night, he would be teaching coding to the young and young at heart. In between, he experiments with Raspberry Pis and other IOT gadgets. Kasia was born in Poland and grew up with a great passion for art and new discoveries. As a child she wanted to become Africa’s leading explorer, lighting designer, exhibitions curator and writer before eventually settling on her biggest passion - architecture. Her adventurous nature brought her to Singapore in 2012 but before that she graduated with a Master’s degree in Architecture from universities in Poland and France. After several years of working as an architect, Kasia decided to expand her horizons and explore the new fields of design. Currently she is gaining experience as a UX designer. Kasia also enjoys photography and her daily yoga practice. We are grateful to our families and friends for their support and donation of time and talent!